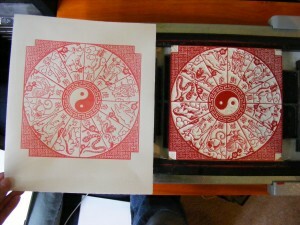 My latest print, Zodiac, was inspired by Chinese cut paper designs. The border pattern is a traditional design, and I really wanted to print it in a bright red to mimic the traditional color of the cut-paper. I finally got my printing equipment back after the move, so I was dying to use my little Richeson “baby” etching press. 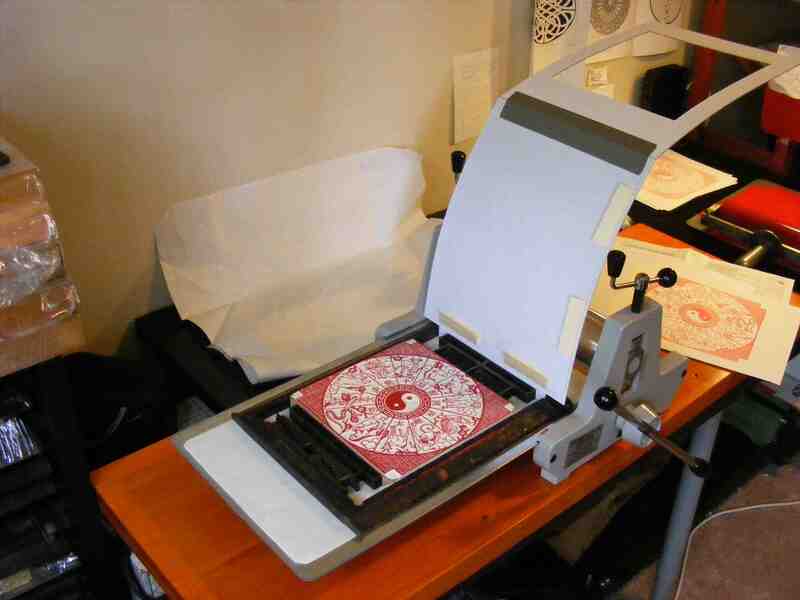 This little table-top press is great for any kind of printing techniques. In the picture above you can see my printing set-up. I centered the block in the chase and laid it on the bed-plate of the press. I made the frisket out of a thin mat-board. The rigidness of the mat board worked much better than the flimsy folders I have used in the past. Instead of gauge-pins, I used bits of manila folder to align my paper in the frisket. Here is the block with the finished print. I am quite happy with the way this print turned out!